Configure Price Quote software (CPQ) is an example of one such intelligence driven technology that is helping industrial businesses address the challenges of personalisation and Industry 4.0. Lets discuss specifically how CPQ software can help businesses remain competitive in this new landscape. Manufacturing companies must have the ability to handle many different manufacturing processes and have them ready to go without major re-tooling or plant modifications. The advanced scheduling module in CPQ allows businesses to switch between processes and production technologies with minimum delay. This facilitates and assures the continuous smooth and steady flow of product through the production process. CPQ helps companies obtain this level of flexibility & intelligence by maintaining comprehensive part and assembly data on all products produced by the enterprise. As prospects and Sales discuss options and product solutions, bills of material (BOMs) are created and communicated to manufacturing operations. CPQ helps to ensure that everything is available for the build process and after completion for delivery to the customer. To maintain a competitive edge businesses must ensure supply chain efficiencies, globally. A CPQ application can communicate pending part and supply needs to the supply chain management system early in the buy cycle and continuously throughout. Needs are anticipated much earlier than when a firm order finally appears. Additionally, supply limits and inventory issues can be communicated back into the CPQ system to alert sales and the buyer that an issue may exist. Back-up sources may be brought in, and redundant resources may be called upon to fulfill the needs associated with a given order. Demand for specific products will almost certainly vary over time. Some demand spikes and valleys are easy to anticipate while others are more unpredictable. Agility plays a central role in the manufacturer’s success. The ability to move from market to market as demand dictates is essential. 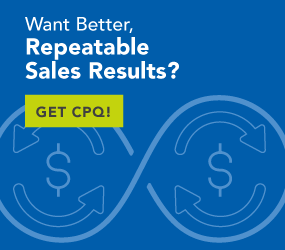 CPQ helps overcome issues associated with demand variability. Having the ability to configure and sell multiple product variations mitigates market-specific demand issues. Tribal knowledge related to one market is not lost through lack of activity; those esoteric rules and knowledge bytes are built into CPQ’s rules engine and the scripted interviewing process. Those rules may be invoked 100 times per day or once every 10 years with equal consistency and accuracy. Remaining competitive often means businesses must expand their markets into new geographies and under a variety of contractual rules and laws. CPQ has the ability to maintain and control access to multiple price lists based on multiple factors. International currencies and customer status such as national accounts or target-market customers can be combined into various combinations of price lists. The system mitigates confusion, missed discounts and illegal discounts and enables auditable contract compliance. While a CPQ system is not the only piece in a businesses digital transformation it does facilitate some important steps in inserting digital intelligence into your manufacturing processes.